Green is the color of spring, and for Evan Chender, sous chef at Well-Bred Bakery & Café, it’s the flavor of the season as well. “Biting into those fresh spring greens, so full of juice and sweetness, is a marvelous taste experience,” says Chender, who has been growing and preparing vegetables for farm-to-table restaurants since 2010 in New York, Tuscany, Copenhagen, and now at the café’s locations in Weaverville and Asheville. Chender captures the flavors of his greens in seasonal salads and piquant sauces. And despite his advice to “cook them as little as possible, or better yet, eat them raw,” his greens often find their way into savory soups and pillowy phyllo-enfolded vegetable pies, prepared in the style of Southern Europe. In 2013, Chender launched his business, The Culinary Gardener, and now he grows 100 varieties of vegetables, edible flowers, and herbs on a 6,000-square-foot plot in Weaverville. In addition to specialty lettuces and spinach, he raises less common greens that are often difficult to obtain: mache, sorrel, escarole, petite mustards, claytonia, and several Italian chicories, including puntarelle with its giant dandelion-like leaves. 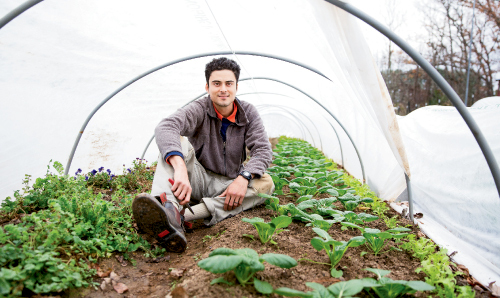 He cultivates greens year-round, employing row covers and a low tunnel hoop house. Last year, his modest plot yielded a whopping 1,600 pounds of produce. As both a farmer and a chef, Chender carefully researches and selects varieties that are delicious and beautiful. A self-proclaimed control freak, he samples leaves continuously from the time they sprout, harvesting as soon as he determines they’ve reached their peak. “It’s a combination of taste, size, and appearance,” he explains as he shows off the delicate, frilly leaves of a freshly plucked French escarole. Freshness makes all the difference—the greens he gathers in the morning will be on someone’s plate later the same day. And while some of this bounty goes directly to Well-Bred, Chender also sells his specialty produce to several Asheville restaurants, including The Bull and Beggar, Cucina24, Table, and The Market Place. Spring Gardening Tip: Most greens tolerate cool weather better than heat, so extend your harvest by employing row covers or a low tunnel hoop house early in the season.